I am very happy to report that all of the beadwork for my secret project is now complete! I feel like I’ve just crossed a finish line - not least because I need a bit of a break. Right now my bead tray is almost completely empty. Apart from the usual apparatus, the only things on it are a cup of freshwater pearls that I forgot to put away the last time I had my pearl bead box out. I won’t be starting on any fresh new projects for at least a few days, as I’m using my normal beading time to work on this year’s felt Christmas gifts - tiny pillows with Minecraft faces on them. I’m also whipping up a “tacky Christmas sweater” for my a school Christmas party. Apparently they are all the rage this year, and everyone is going to be wearing one to show school spirit. We went with some simple felt shapes like ornament globes and a beribboned gift. There has been one new addition to my workspace this week. I was shopping for stocking stuffers and decided to treat myself to a pencil and paperclip caddy. It’s absolutely perfect for storing and organizing excess bead packs while I’m working on a project. It also keeps materials out of my elbow space until I get around to putting them away. There’s something truly wonderful about the form of jewelry we call bracelets. As a project, they’re right in the middle of the road – not as instant as earrings, or as lengthy as necklaces. They can be worn with anything but the longest of sleeves, and are comfortable in almost any weather. No piece of jewelry provides quite as much movement, jangle, poise, or punch to an outfit as a gorgeously made bangle or bracelet. In her new book, Beautiful Bracelets By Hand, the founder of We Dream in Color has created a treasure trove of inspiring designs. 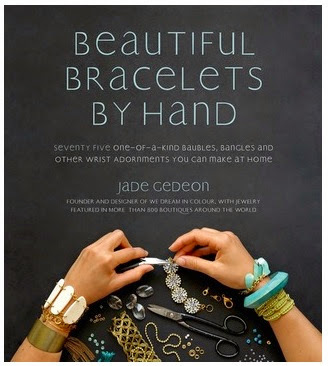 Jade Gedeon’s 75 beautiful bracelets will delight beaders and jewelry makers of all skill levels. There are 8 chapters in all, dividing the projects by their essential materials. The Beads chapter features bold focals and understated heishi beads. Bits & Pieces encourages readers to experiment with found objects, buttons, and upcycled jewelry. 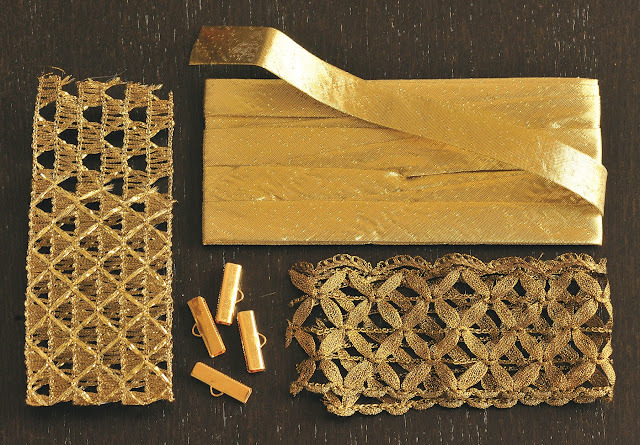 There are also projects devoted to the beauty of Chain, Fabric & Cord, Leather, Metal, Plastic, and Wood. 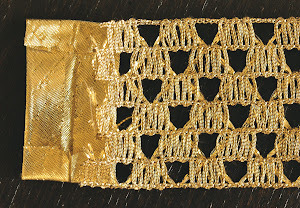 Although the materials vary greatly from the first project to the last, the techniques used are both enticing for experienced beaders, and simple enough for the weekend crafter. 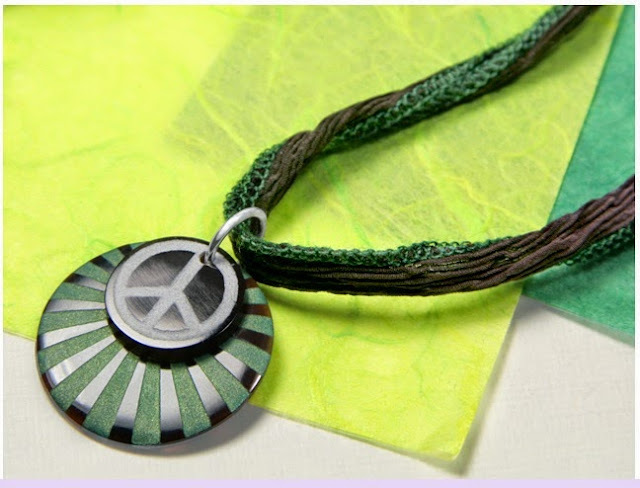 Beautiful Bracelets by Hand includes instructions for wire wrapping, crimping, resin molding, polymer clay smooshing, simple woodworking, and much more. All of the projects are united by their very trendy looks and flair for decidedly pretty design. This book would make a fabulous addition to any crafter’s library. Jade Gedeon and Page Street Publishing have generously provided a sample project from the book for Inspirational Beading readers to try. 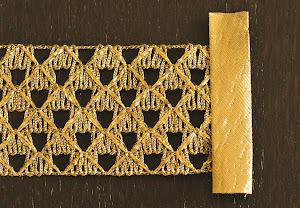 This Lace Cuff bracelet from the Fabric & Cord chapter provides a pretty pattern with instant gratification. Enjoy! New or repurposed, lace of any sort makes a pretty piece. 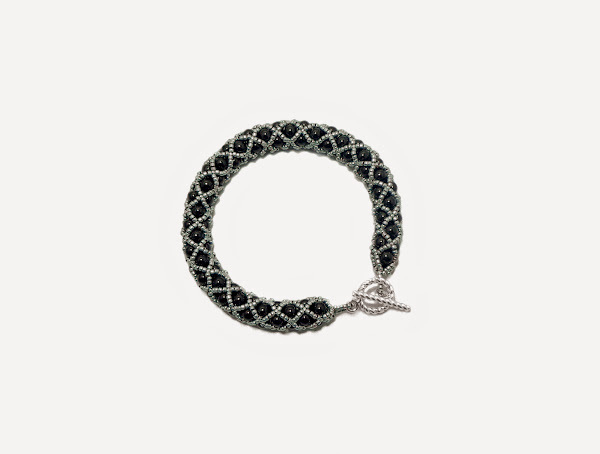 We picked vintage and antique metallic weaves to give this ladylike bracelet a little edge and a good pop of glam. 1. Big wrist? Small wrist? Wrap ribbon around your wrist so it is slightly loose. Trim so there is about a ½-inch (1.3 cm) gap between the ends. Cut your bias tape about ½ inch (1.3 cm) longer than your ribbon width. 2. Fold the excess bias tape into itself and crease. Do this on the top and bottom edge. 3. Since you’ll be using HOT glue, take care not to burn yourself. Press any edges down with a piece of card or a spoon rather than your fingers unless you don’t mind a blister or three. Now that we are clear on that, with a few dots of hot glue, stick the top and bottom folds down. Sandwich your ribbon edge in between the folds of the bias tape. Apply a few small dots of glue and fold and press (again with a card or something without nerves) the bias tape over the ribbon. 4. Center the ribbon crimp on the bias tape. With a pair of nylon-jaw pliers, firmly close the crimp onto the ribbon. Attach a 10mm jump ring to one end. Attach the lobster clasp with a 4x6mm jump ring to the opposite end. 5. Make another. That way one wrist won’t be jealous. 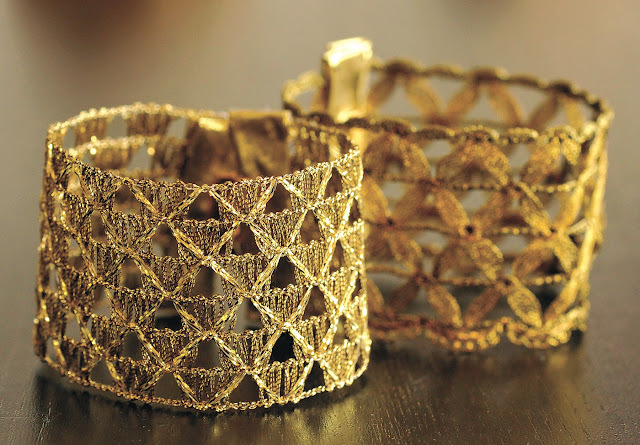 I would like to thank Page Street Publishing for giving me the opportunity to preview this gorgeous book, and for sharing the Lace Cuff tutorial. Inspirational Beading has not received compensation for mentioning titles or products in this post; however, actions you take from this page can result in a commission for Inspirational Beading. Jade Gedeon and Page Street Publishing Co.
Our final trio of Pantone fall colors is a little late, but luckily I saved the best for last. 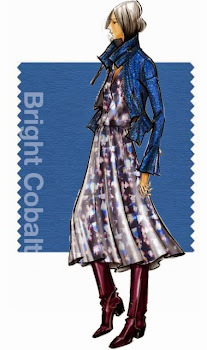 The not-quite fall color from this year’s line-up that I chose for center stage in the third collage was Bright Cobalt. Although I had planned on exploring the possibilities a lot sooner, it does make for an excellent winter color as well. The challenge this time would be to come up with ensembles for both fall and winter, using my remaining colors Cyrpess green and Mauve Mist. Though the other two colors in the palette both have a muted, dusty quality, I wondered how well the trio would work together in garments. Luckily it was easy to find pieces for all three, and I ended up with some fun outfits. For a casual look I went heavy on mauve and cypress, with hints of cobalt. For formal, cobalt and cypress lead with accents in mauve. This time around I included jewelry designs from one of my favorite places – Faire Collection. The new line up of tagua and other natural jewelry is as stunning as ever. This month’s collage include a gorgeous Tagua Gem necklace in blue and green, Moon Sliver tagua earrings, and a two-tone bullhorn bangle in blue and black. Faire recently added some new artists to their Ecuador team. 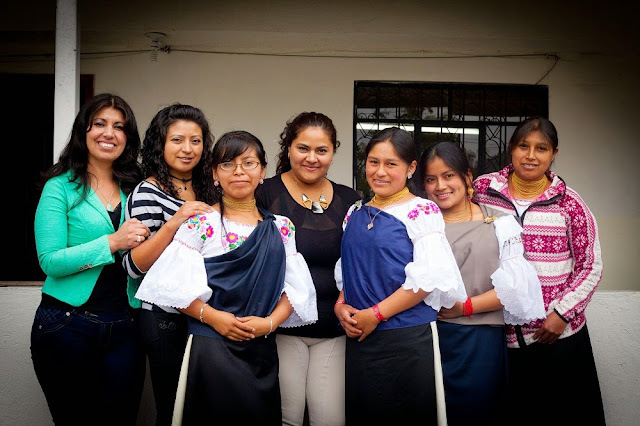 These talented ladies help to create the gorgeous fair trade jewelry the collection is known for. If you’d like to learn more about the collection and cause, check out Faire founder Amanda Judge’s informative pieces about fair trade with Conscious Magazine. What are you favorite winter colors for jewelry? It’s that time of year again when much of our inspiration comes in the form of red and green palettes, frosty and sparkly finishes, and gifts for the jewelry lovers in our lives. 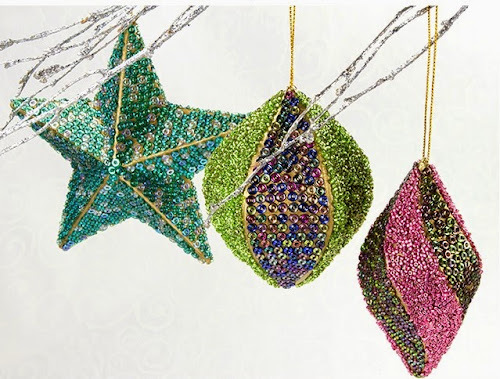 This year it was really tough to choose just a handful of holiday beading tutorials – the inspirations are abundant! Here are just a few of my favorite projects. 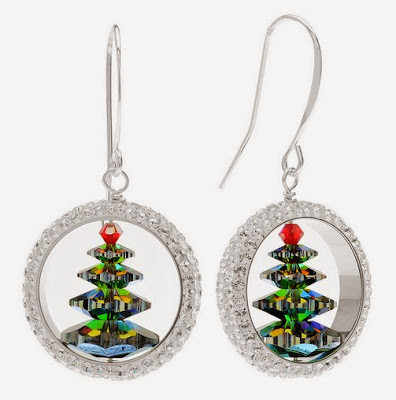 Captured Crystal Christmas Tree Earrings by Beadaholiqe. 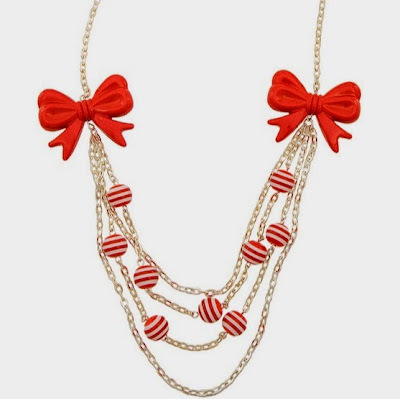 brings to mind ribbon-wrapped peppermints. is exactly right for a charming stocking stuffer! 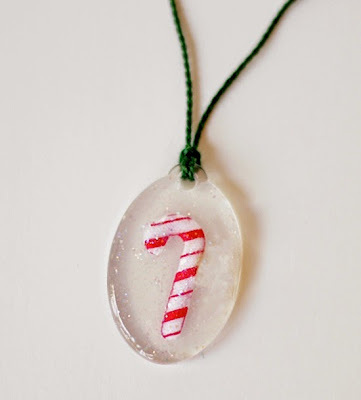 this Frayed Ribbon Necklace project with ceramic focals by Ornamentea will make you merry. hollow Wire and Bead Christmas Ornaments by Everyday Art. 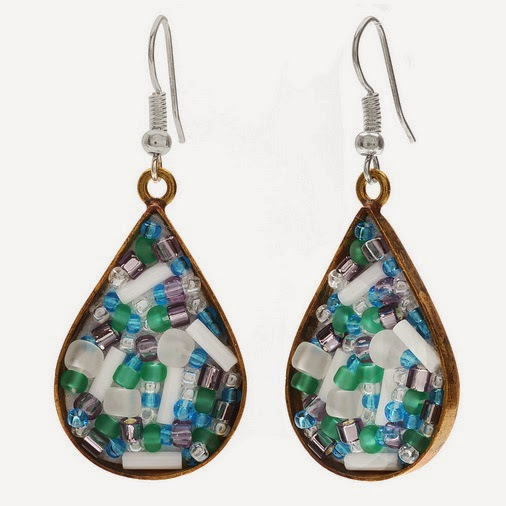 It’s a great project for using up leftover beads, too. 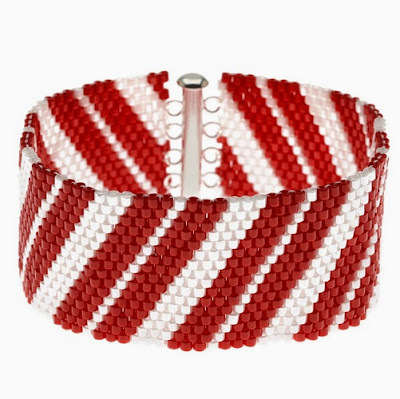 The simplicity of this Candy Cane Striped Cuff by Beadaholique really makes statement! 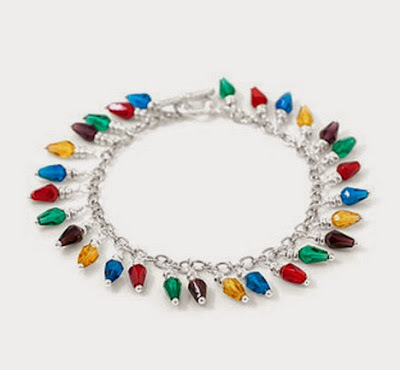 like this Lights of Christmas Bracelet from Fusionbeads.com? 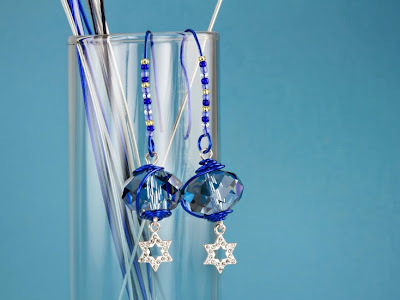 featuring Swarovski crystals wrapped with designer jewelry wire. 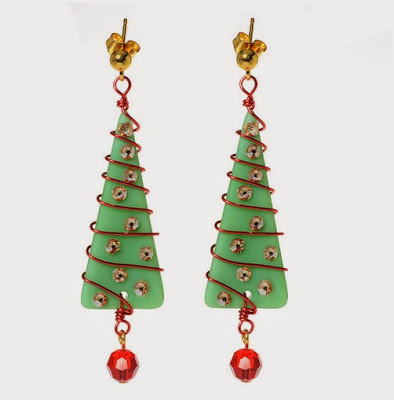 wire-wrapped Deck the Halls Earrings. Are you making beaded decorations and handmade gifts this year? What are you favorite materials to use? Happy holidays and happy beading! I have just a quick snapshot of my workspace this week as I scramble to finish up the last of my top secret projects in time to start on this year’s handmade Christmas presents. Stormy gray weather is not helping with what little photography time I have either. I’m going to remember this the next time I bring up how wonderful winter is! Right now I’m working with a lot of freshwater pearls, including a few new colors that I added to my stash recently. I’m loving the olivine in particular, which goes really well with a lot of different palettes. It took me several attempts to get just the right balance of beads in the piece that I’m working on, and no matter what I added, the colors looked great. I had hoped to go with teal Picasso for the main accent at first, but I’m going with the gray instead. I think it’s going to turn out great when all the stitching is done. 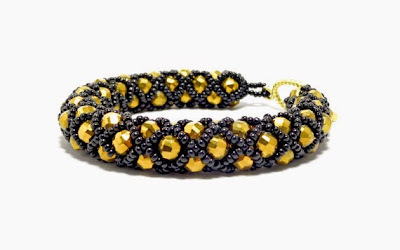 The line between bead lovers and bead horders can be very thin – if it exists at all – and there’s no doubt that bead embroidery is one of the best techniques for sustaining our obsession. 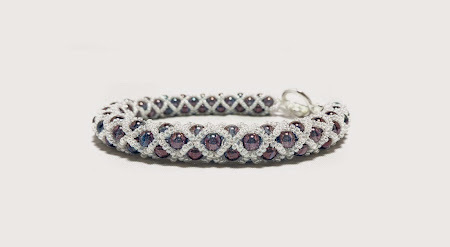 No matter what your favorite materials are, there’s an application for them in bead embroidery. 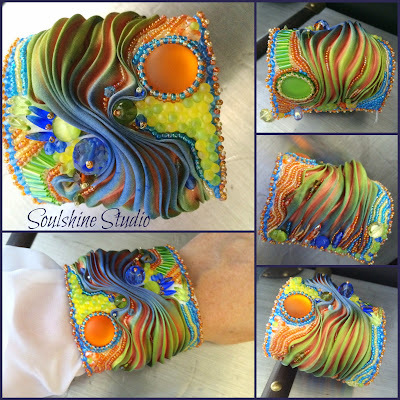 Today’s guest is Ann of Soulshine Studio bead shop in Corning, New York. 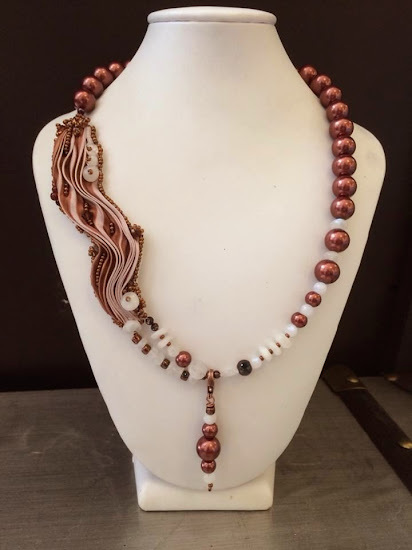 Her bead embroidery designs feature a gorgeous array of unique materials such as shibori ribbon, cabs, drops and unique focal pieces. Inspirational Beading: What is your favorite beading or jewelry technique? Ann: My absolute favorite technique is bead embroidery. I love it so much, I dream about new projects, and I have piles of beads that are intended for specific ideas - who knows if I'll ever get to all of them? I look at my projects like paintings, the beads are paint. Bead size, color, finish - they're all important to the outcome. Where the beads are placed in relation to each other is key to a good design. Placement can change the look of the beads, and eventually the look of the whole piece. 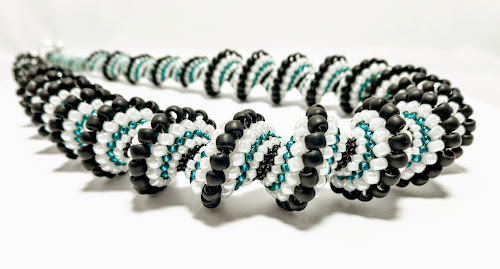 Inspirational Beading: How did you first learn to do this technique? Ann: I learned on my own. I saw pieces that others had made, and I wanted to try. 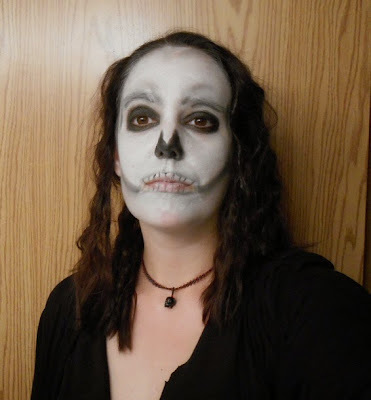 I really didn't know what I was doing, so my first attempts were a bit wobbly. I borrowed books from the library, and learned so much! I then purchased a couple of books to use as reference, one by Margie Deeb about color theory, and one by Sherri Serafini and Heidi Kummli on bead embroidery techniques. I still have those - they're well worn! Last year I went to the Colorado Bead Retreat and took workshops by Sherri and Heidi, and I learned so much more! It was thrilling to meet them, and to ask quesions specific to my own work. They both helped me grow, and my beadwork is better today for having had the chance to speak with them, show them my work, and get honest feedback. I would recommend taking a class or workshops with teachers that you admire. It's a great way to learn more not only about the technical aspect, but also about your own work and style. Ann: My absolute favorite is the 'King Hummingbird' cuff bracelet. I love the colorway: the gunmetal and black and grey. I love the textures. The flow of the shibori ribbon I used in the cuff just seemed so natural as it all came together. It practically made itself, and it sold almost immediately. I had posted it on Facebook, and I had a request for it the day after it sold, so I made another quite similar to it. One of these days, I'll make one for me! 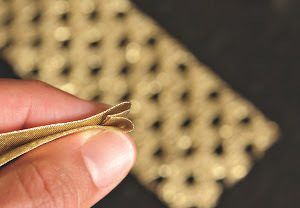 Inspirational Beading: Can you share any tips for getting started? Ann: Jump in! Just try it, really. So many people say they don't think they could ever do it, and I thought the same thing before I tried it. Find a 2-3 inch stone or cabochon that you love, go to the library or online and read up on some pointers, then go for it. And remember that practice makes perfect. Using thread means working with tension, not just in beadweaving but bead embroidery as well. The direction you point your needle when you sew, where you place the needle in relation to the beads, all of these things are important and make a difference. You should understand that only by doing will you learn. Ann: My favorite colors seem to be dark. Gunmetal, antique bronze, antique copper mixed with deep jewel tones are my go to colors. I feel like they're mysterious, they create tension and depth. I've recently started using shibori ribbon as well, which I adore. The folds of the silk, the variations in each piece, the flow of the colors into one another all add wonderful texture to bead embroidery pieces. Midnight Borealis is my favorite color of shibori ribbon - it's a deep grey dyed over with deep green, blue, and purple. Perfect! Ann: I would absolutely recommend learning bead embroidery. It's versatile. You can take your piece in any direction you choose. 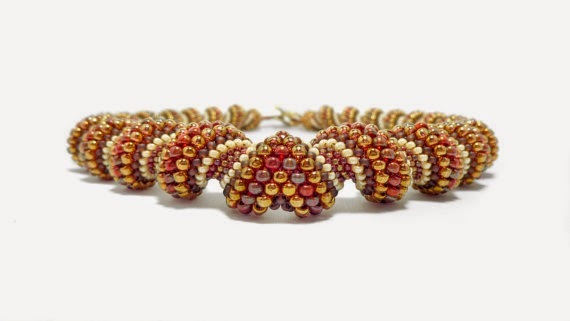 With so many styles of beads on the market today, you could make the same piece using different beads over and over, and come out with totally unique pieces. 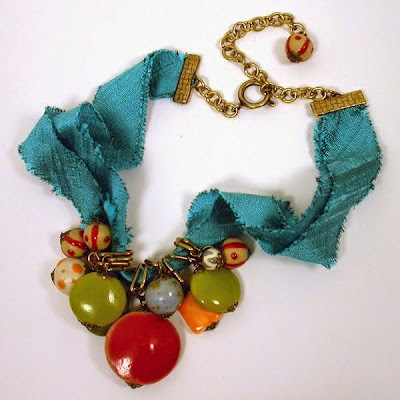 Adding shibori ribbon or lampwork focal beads or Swarovski crystals will add variety as well. You could make earrings, bracelets, necklaces, brooches, headbands, barrettes, rings, tapestries...the possibilities are endless. Inspirational Beading: What is your least favorite thing about working with this technique? Ann: My least favorite thing about working with this technique is the time it takes. I have so many ideas, so many things that I want to create, and because of the size of the beads, they take hours and hours. 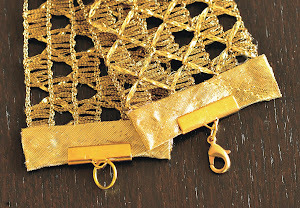 A cuff bracelet typically takes 20 hours, earrings can take 4-5 hours. My biggest piece took about 50 hours. When we fall back on a favorite bead style, sometimes it’s just for the comfort of knowing exactly how they will look in a design, or just the right beads to pair it with. Sometimes it’s just because we love to see them and work with them. Right now almost all of my favorite things are old faves in some way or another, although I did finally get around to picking up some of the new Czech glass O beads at Aunties Beads. They are incredibly adorable, and I’m looking forward to seeing how they’ll work in my favorite designs. Although I’d love to see more opaque or single-tone finishes in future releases, I’m pretty happy with the red azuro color that I chose. It’s red and blue and gold all at the same time. I recently surfed around at Fire Mountain Gems, and did a little stock-up on basics like Fireline. 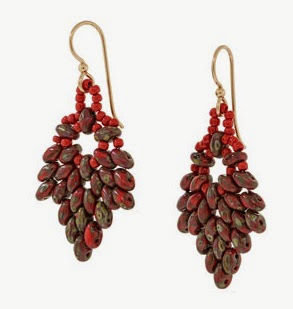 I made a point of seeking out several new and old shades of red in 11/o seed beads. For the past few months, it seems like every time I sit down to design something, I need red – but I only have a handful of finishes to choose from. Now I’ve got plenty, and I’m particularly fond of these lovely rainbow rubies. The AB finish will allow them to blend in with a wide variety of palettes. Another new addition to my stash is these Czech glass coins in one of my all time favorite finishes – tortoiseshell. I love the transparent topaz color with its flecks of black. It’s a little like an animal print, a little like a gemstone. I’ve already got a design lined up for these beauties and I can’t wait to get started. What colors and shapes are your go-to favorites? Last week we took a look at fashionable pearls in the time of Elizabeth I. 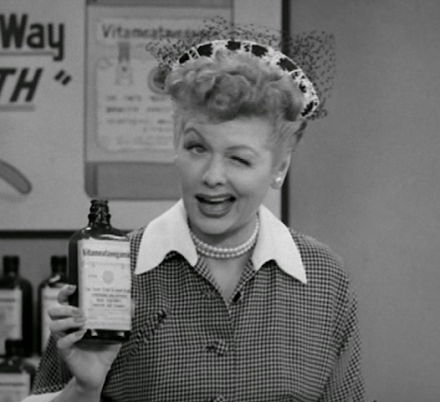 Fast forward 400 years, and we have another surge of pearls, as seen on stars such as Lucille Ball. 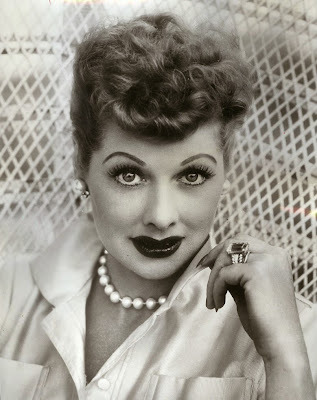 The actress wore her share of costume jewelry, and was a big fan of designs from the Miriam Haskell collection, which helped popularize the faux pearl and crystal rhinestone. Though there is some speculation about the amount of designing done by Haskell herself, it’s certain that she did seek out and promote many skilled artists from the 1920’s to the 1960’s, leaving behind an amazing legacy of jewelry. When you go for faux pearls, do you prefer glass or shell? This week I’m working on a project that is very exciting, mostly because of the beads that are going into it. The techniques are simple, but the colors are fantastic - I can’t wait to see the finished piece! I’m combining matching Rullas and SuperUnos in a gorgeous coral red Picasso, with my own custom mixture made for the look of lapis lazuli. I mixed together some matte black AB – which has a dark blue look and hints of green, red, and purple – with a small dash of transparent light topaz AB for the flecks of gold. It turned out so nice that I want to make more and use it again in other projects as well. In our last color experiment, we explored using purple as a fall color, inspired by Pantone’s color of the year, Radiant Orchid. Thanks to some great pieces in Cognac and Misted Yellow, I’d say it was pretty successful. This time I’ve upped the challenge with the even pinker hue of Sangria. Although at first glance the color lineup for this fall doesn’t scream autumn, there are several colors that look right at home in the season, when taken individually. For this week’s palette, I chose Aurora Red – a somewhat lighter shade with just a hint of orange. The final player in the trio is frosty neutral Aluminum. What I like about this palette is the suggestion of winter on the horizon, which makes the addition of warm Sangria seem very appropriate for fall. The biggest challenge for this collage was finding the right balance of colors. Too much purple would make things too busy, while too much red would be overly dramatic. 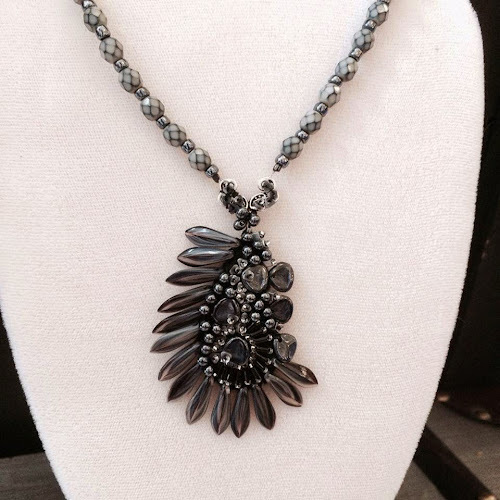 Luckily, I was able to find lots of pieces that almost perfectly matched my color choices, including a gorgeous fringe necklace with red ostrich feathers and an element of gray in the leather and chain base. I couldn’t resist adding some red rain boots to go with the jackets and overcoats. All it needs is a mug of apple cider and there’s no mistaking the autumn vibe. 1. 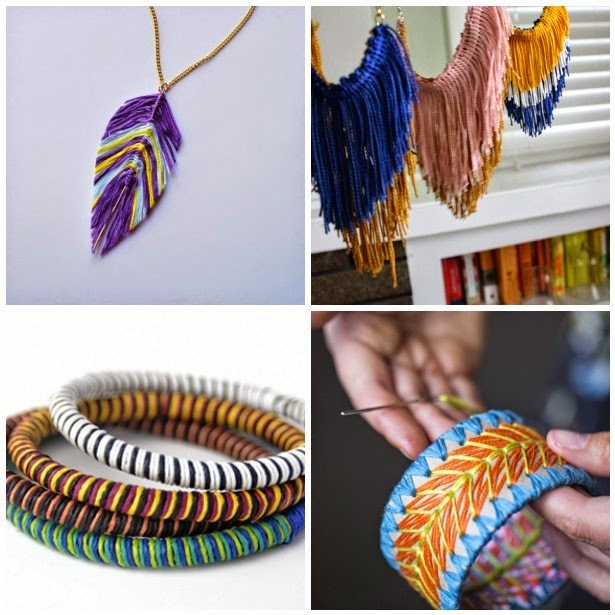 This String Feather Necklace Tutorial by Hey Wanderer makes great use of embroidery floss. Add a few Swarovski crystals and it’s perfect! 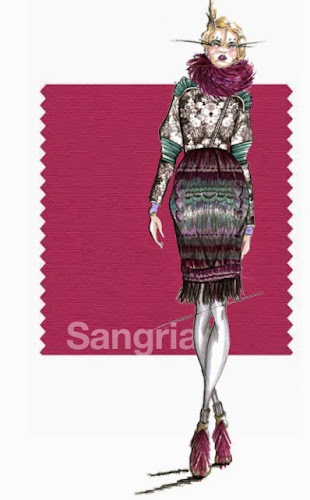 allows for lots of gorgeous color combinations. 3. 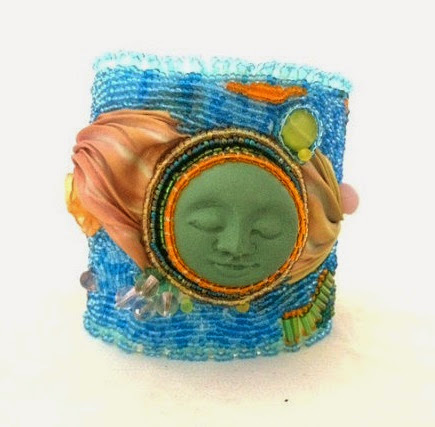 If you love to wrap, this bangle tutorial from Paperphine is worth a try. The project uses paper twine, but could also work with your favorite fibers. started out as a roll of packing tape? 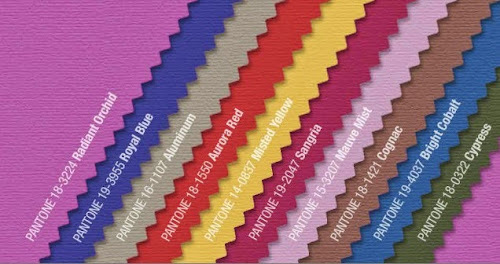 How would you use purples and pinks in your fall palettes?